Richard Western build top quality farm trailers and manure spreaders including grain trailers, root crop trailers, silage trailers, dumper trailers, muck spreaders, dual spreaders, grain chasers and transfer wagons since they were founded back in the 1960’s. Suffolk Tipper Trailers: With 8 models in the range with capacities from 13.21cu mtr to 28.98 cu mtr and tipped heights of 5.63mtr to 9.00mtr, they feature height adjustable sprung drawbar, hydraulic tailgate with rubber seal and auto lock and Hydraulic safety check valve on tailgate. Suffolk Silage Trailers: With 8 models in the range with capacities from 13.21cu mtr to 28.98 cu mtr and tipped heights of 5.63mtr to 9.00mtr, they feature height adjustable sprung drawbar, hydraulic tailgate with rubber seal and auto lock and Hydraulic safety check valve on tailgate. Rootcrop Trailers: With 5 models in the range and a tipped height of 6.23mtr to 9.00mtr, these trailers feature a Monocoque tapered body with pressed floor and sides, 4mm floor, 3mm sides and closed channel sub structure and twin three stage tipping rams to give 55 degree tipping angle. Wellington Trailers: With 5 models in the range, these trailers are designed for tough jobs and have a tipped height of 7.12mtr to 9.55mtr and feature a Monocoque tapered body with 4mm sides and 4mm floor, hydraulic safety check valve on tailgate and a 60 degree tipping body. Bale and Pallet Trailers: A range of tandem axle flatbed bale & pallet trailers. Available in 10, 12 & 14 tonne models with 4mm steel floor, 2ft headboard, hydraulic brakes and load sensing valve for hydraulic brakes. Dumper Trailers: With 5 models, these large capacity dumper trailers are suitable for agricultural and general use. Available in 8, 10, 12, 14 & 16 tonne models with 4mm Steel floor, 3mm sides, inspection ladder, hydraulic brakes and hydraulic safety check valve on tailgate. Delilah Manure Spreaders: The Delilah Manure Spreader is a heavy duty spreader designed to handle all types of manures, FYM, semisolid, poultry litter, industrial sludges, composts, waste products etc. There are 6 models offering a cubic capacity of 6.44cu mtr to 14.4 cu mtr. FBS Manure Spreaders: These large capacity, wide bodied spreaders are designed to handle all types of farmyard manures, sludges and waste products and with a 2 metre wide body and big cubic capacity the FBS is particularly suited to handling low density materials. Spinning Disc Manure Spreaders: These are equipped with twin horizontal beaters and spinning discs. The discs have a 6, 3 or 2 blade configuration with blade angle adjustment for accurate spreading control. There are 2 models with a capacity of 11.9cu mtr and 14.4cu mtr. SDS Manure Spreaders: The SDS (side discharge) manure spreader range is designed to handle semi-solids, sludges and slurries. The heavy duty central auger with aggressive spaced paddles prevents load bridging and ensures a constant flow of material to the spreader rotor. With 5 models offering capacities from 7,264 ltrs to 16,363 ltrs. Grain Chasers: The GR range of grain chaser bins are the new generation of harvest chaser bins designed for high output combine harvesting with impressive standard features to give maximum operating efficiency while minimising ground compaction by using low ground pressure tyres. There are three models to choose from; the GR18 and GR24 running on tandem axles and the GR30 on three axles with a rear steering axle as standard. Drill Fillers (Meat and Pellet Feeders): These hydraulically driven drill filler has been designed as an economical means of transporting grain and fertiliser to drills and spreaders. They are available in 6, 8 & 10 tonne models and have a hydraulic driven unloading auger and the auger is raised and lowered by the means of a hand winch. To give access to the top of the hopper, a ladder and mesh grid are provided. A waterproof cover is also supplied. Stone and Rubble Trailers: Heavy duty trailers for moving stone and rubble available in 20 and 24 tonne models with three body size options. These Stone & Rubble Trailers have been designed to handle the tough jobs. The model options have a carrying capacity of 20 or 24 tonnes and are available in sizes of 8, 9, 12 and 15 cubic metres. Livestock Trailers: A range of drop bed livestock transporter trailers for transporting all types of farm animals. The Easy Load Livestock Transporter Trailer is designed so that the bed of the trailer lowers down to the ground by pivoting the axle. Using the tractor hydraulics the axle is returned to the transport position and locked in place for transport. Features include LED lights, internal divider gates and a canvas roof cover. 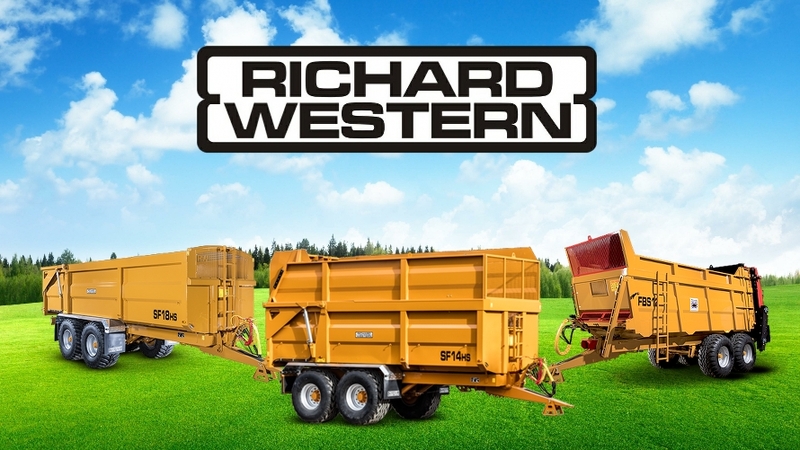 For more information on the range of Richard Western trailers and manure spreaders, please contact our sales department or visit the Richard Western website.